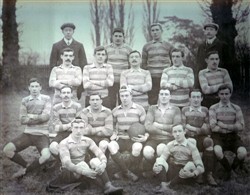 Olney RFC, black and white team line-up photograph season 1909-10. Names listed as: W. C. Morgan (Hon. Sec), A. Minard, C. Kitchener, H. B. Lineham (Hon Treas. ), E. Harrison, W. Dix (Vice-Capt. ), J. Longland, J. B. Berrill, H. Andrews, W. H. Whiting, C. Wallenger, R. Clifton, S. D. Kitchener (Capt. ), N. C. Hatton, J. Andrews, E. Minard, J. Simcoe, F. Millward.